Library produced post cards and greeting cards to promote the facility and it's mission. The Greeting Cards, using Taiwanese Language to spell out "Thank You" or "Happiness" are suitable for any happy occasion. 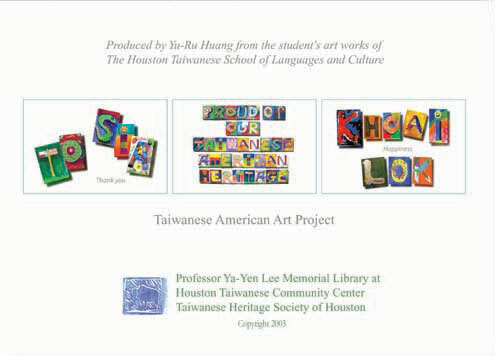 To purchase or sponsor this card project, please contact Mary Huang at Houston Taiwanese Community Center. ​Educational information: Library provides Taiwanese American Heritage information, in visual and written formats, targeting the popular topics for school projects.